For the uninformed, John Hagee is a mega church pastor from Texas. He is an unapologetic worshipper of the United States and Israel. I say worshipper because these things have become idols in his life and his preaching. So much so that he famously preached recently that atheists should "get out of my country" if they didn't like to hear Merry Christmas. Strange evangelism tactic. He also is a shameless shill, making money off of the absurd blood moon theology from last year. Scaring people into buying his latest book about this nonsense. His idol worshipping of Israel has led him to be a dual covenant theologian. He believes and has preached that the Jewish people do not have to go through Jesus Christ in order to be saved. That they are in fact under their own covenant that supersedes the New Covenant of the cross. One of the most diabolical schemes the enemy has ever cooked up. The convince pastors that God's chosen people do not need the Gospel. This despite the fact that the Bible clearly states that none come to the Father except through Jesus Christ. With this resume, one would expect that John Hagee is very opinionated politically and that is most certainly the case. Here is his most recent video about this year's presidential election that should result in his losing the tax exempt status for preaching politics. I try to stay clear of garbage disguised as Christianity but I feel compelled in case some people are genuinely confused by some of the lies in this brief video. Let us deal with each individual item that relates to our faith. Hagee opens up by quoting someone who once said that to see evil and not call it evil, is evil. That not speaking is speaking. That not acting, is acting and that God will not hold us harmless. While the quote might sound like it achieves a certain level of gravitas, it is not Scripture. Throughout the rest of the video it is clear that "evil" in this case is whoever the Democratic Party chooses as their candidate. Hagee however is making a political pitch and wrapping it up in pious sounding Christianese that is simply not supported biblically. The verse that comes closest is the key verse today from the Prophet Isaiah. What Hagee is of course missing is the fact that the candidate he is pushing Christians to vote for is also evil. Points like this are always lost on Hagee who simply shills for the Republican Party and thus pretends they are always the righteous choice. Last time it was a Mormon and this time a philandering business man on his third marriage who thinks communion wafers are crackers and the Book of Second Corinthians is called "Two Corinthians." Beloved, this is not to advocate for the other side either. It is a clarion call for Christians to wake up and stop calling evil good. I think if Satan himself was running this year Hagee would be talking about how he was once an angel and is the clear choice for the church. This is not Christian -- it is completely and utterly carnal politics. Christians have two choices. They can vote for who they believe is the lesser of two evils or they can choose not to vote. Spurgeon once said that when presented with the lesser of two evils he chose neither. 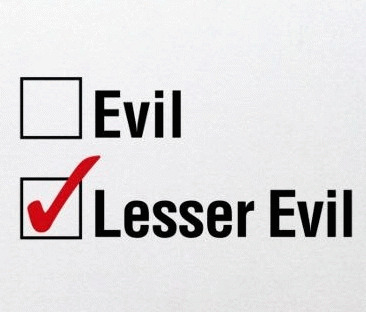 But if we choose the lesser we must not lose sight of the fact that we still chose evil! We should not be trumpeting that choice. We should not be persuading others to our evil choice. We should not be defending it. We should not be making videos about it. John Hagee has been given a platform and a flock to watch over and he is leading them astray. Now, I am the first to admit we do not live by the law. We are under the New Covenant. Jesus however did not come to abolish the law but rather complete it. When you read the Bible do get the sense that God is unloving towards the foreigner? Hardly. More like the opposite. We are instructed by Jesus to pray even for those who persecute us. Jesus forgave the Roman soldiers as they were hammering the spikes into His feel and wrists! Yet the Christian choice is the guy who wants to build a wall and deport people who have families here? That is supposed to be Christian Pastor Hagee? What does the Lord require of us? I know the Pastor Hagee's of the world have forgotten but Christianity is not about them. It is not about us. It is about Christ. If you think there should be a wall around this country that is great but it is not a Christian argument. If you think that people who came here illegally should all be sent home you are entitled to that opinion but it is a secular opinion, not a Christian one. That is the overall point. Beloved, we are on the Titanic. Read the Bible and you will know that. The devil has us arguing over arranging the deck chairs instead of telling people the ship is sinking and pointing them to the lifeboats. Jesus Christ is the only lifeboat. He is the only way off of this ship. There is nothing righteous about Hillary Clinton. There is nothing righteous about Donald Trump. Vote as you feel led but realize at the end of the day it is a vote for one evil over another and there is no point arguing over the severity of the evil you voted for. So vote and then get back to redeeming the time. Get back to the Gospel. John Hagee can get back to writing his next book about when Venus is in the 8th House of Scorpio under a blue moon during a Jubilee Year. And we can get back then to ignoring him.